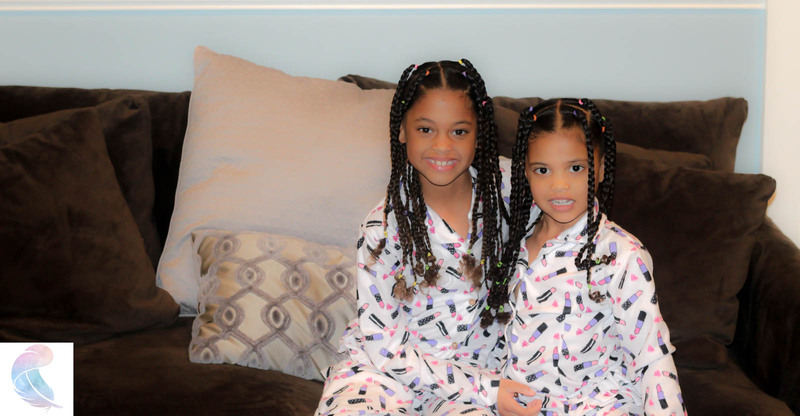 The time it took to braid and unbraid Giana’s hair when we did the box braids may be a deterrent for some moms. 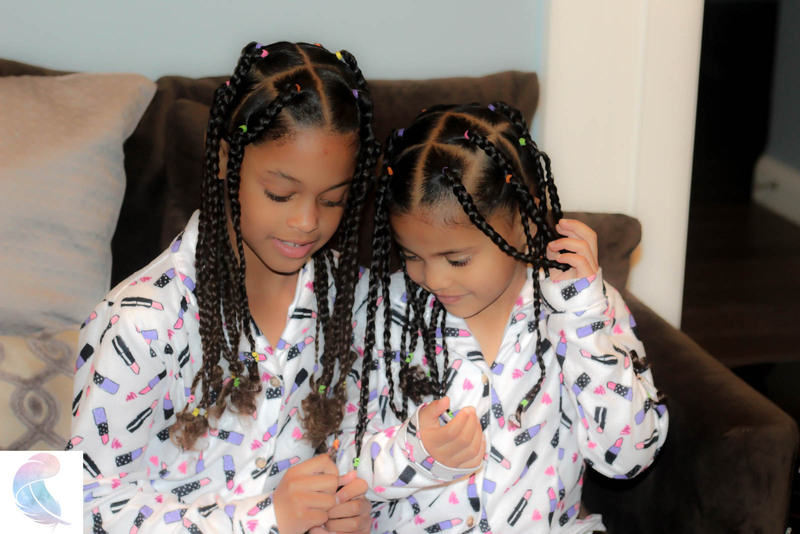 If you are searching for a protective hairstyle for kids, Jumbo Box Braids is an easy option. 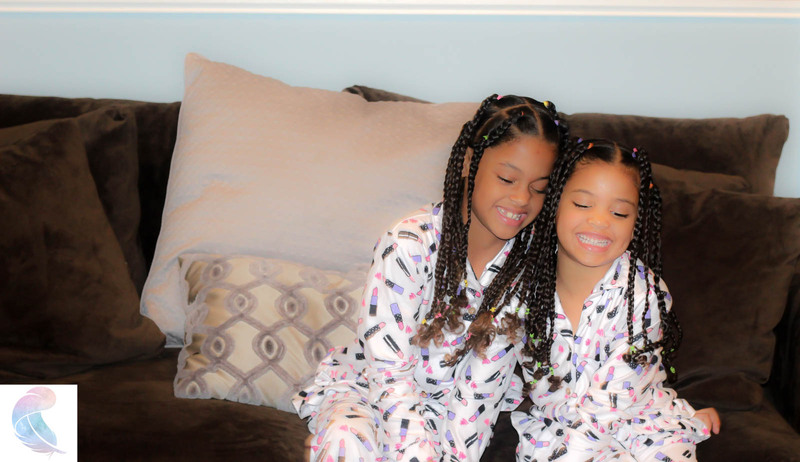 This kid’s protective hairstyle will also give you a cute style with longevity in less time. With two heads to do every wash day, easy and lasting kid’s hairstyles is where it’s at for my biracial beauties curly hair. We didn’t jazz up our natural braided hairstyle with accessories since we were headed for bed. Aren’t these matching lipstick PJ’s the cutest? When we did the full set of box braids on Giana’s day off school it took 3.5 hours to complete. While I had hoped for a productive day of writing and house choirs, she pulled me in and we spent time bonding and watching movies. In that case, for me the time invested in her hair didn’t feel like a nuisance. As I felt when I breastfeed my girls, playing in their hair is connects us physically, it’s nurturing and rewarding. Yet, I am aware of the real working mom’s struggle to find time. When I was running my day spa and working outside of my home, I was on the constant grind to keep up with my own expectations, the growth of my company and the needs of my family. I didn’t have the luxury to take that kind of time. Nevertheless, most mothers of mixed kids are aware that the health of their child’s hair is reliant on their willingness to invest a chunk of time in caring for it. I believe the easiest management system is to maximize the styling so that it carries you through the school and work week. With a protective style set your morning routine is simply refreshing the roots, smoothing the edges and morphing the style. While our products fluctuate, on the other hand, our wash day routine remains the same. These Jumbo Box Braids provided us with a quicker option. The natural braided hairstyle lasted the full hair wash cycle. It was a cute mixed girl’s hairstyle with ability to be restyled into variations. The hairstyle can easily be dressed up with accessories. Most importantly, the hairstyle protected the hair and kept it moisturized throughout the week. For a detangling conditioner we swear by Hello Hydration. We are using Babassu Oil & Mint Deep Conditioner. The best leave-in conditioner for the girls that I have found is Pomegranate & Honey Leave-in Conditioner. Divide the hair and into two halves. Divide each half in half again. Use a hair clip to secure each section of hair. Concentrate on ¼ of the hair at a time. Then I divided that section of hair into a 2-inch row. Divide those sections into 2 inch x 2 inch squares of hair. Every head is shaped a little different but the hair is divided into four sections now. On Giana, I split the front two halves of her hair into four braids. The back sections were divided into 5 braids with a triangle shaped sections at the peak of her head. Giving Giana a total of 18 braids. On Misha, her front sections were split into three braids with two triangles over the ears. Her back section was split into four braids on each side. Misha a total of 14 braids. After I applied all the setting products listed above, I sectioned them into squares or triangles. Then I secured the section with a colorful rubber band. If the hair started to dry, I rewet it with a water bottle. We can’t live without this one. Try blending the water with aloe juice and essential oil for extra moisture. Braid each section and secure with another rubber band. Sleep on silk pillowcase at night. Pull the braids into a shower cap while in the bath. Add Mielle Mint almond oil (day 3 and 5 of style) to the scalp on the parts. We added Brazilian Cocktail Curl Mousse to the length of the braid (day 3 and 5 of style) after a light mist in the mornings if they looked frizzy. It took about 30-45 minutes for me to braid Giana’s hair in the morning after bathing the girls. I put Misha’s hair into a bun and waited until after dinner to braid it. Though her hair took a little less time because it has a slightly looser curl patter and it is a bit shorter. We finished in 30 minutes. The style lasted from Sunday to the following weekend wash day Saturday. Swan and Dolphin Resort best value hotel at Disney World!